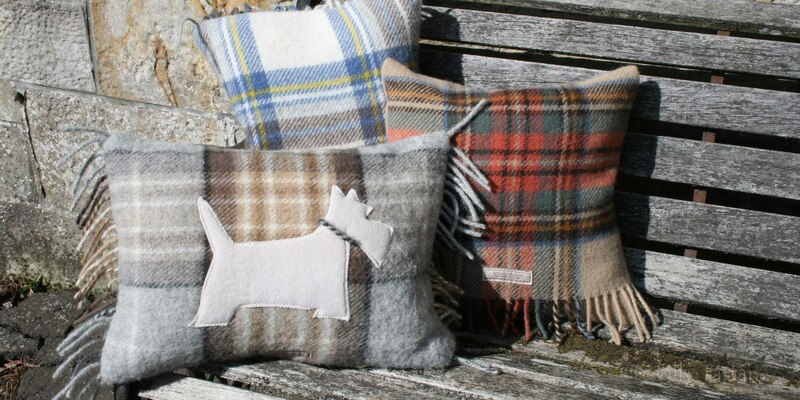 These luxurious all wool tartan cushions and cushion covers are hand-made in Scotland with authentic Scottish tartans. The fashionable rolled fringe feature conceals the envelope opening of the cushion cover and it is filled with a duck feather inner to compliment the quality of the cushions cover. Our cushions are available in small - 12"/30cm, medium - 15"/38cm or large - 18"/45cm. There is also a stylish rectangle cushion measuring 16"x12" and makes a funky statment and an ideal Scottish gift. The rectangle cushion is also available with an iconic scottie dog appliqued on. The scottie is made from soft fleece and is generally done in black or brown to suit the tartan but please email me if you ahve a little Westie and would like it in cream fleece.